Pro baseball in Utica has a long history, including eras as both MLB affiliate and independent team (more at Wikipedia). Many fans know these Blue Jays better as the Blue Sox, the single-A squad that author (and team owner) Roger Kahn profiled in Good Enough To Dream, his up-close-and-personal look at running an independent team. Kahn's storytelling makes a good minor league companion to the player's perspective captured in Dirk Hayhurst's recent books. Felix is...resting his eyes? Just one more reason to snap multiple pictures on team photo day. 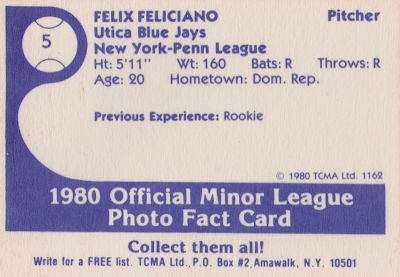 If we believe Baseball-Reference, "rookie" describes Felix's entire career, just 7 games of low-A ball in Utica. That makes today's #5 his only known baseball card and twice the bummer that it's a lousy photo. 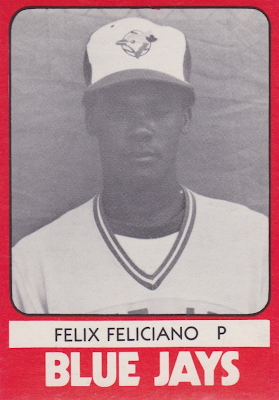 TCMA printed 33 cards for Utica, but just 3 of Felix's teammates eventually reached the bigs; Juan Castillo got the most MLB service time with 199 total games over 4 seasons. Value: This #5 cost $2 at MinorLeagueSingles.com. Few MLB stars means team sets top out at $20-25. 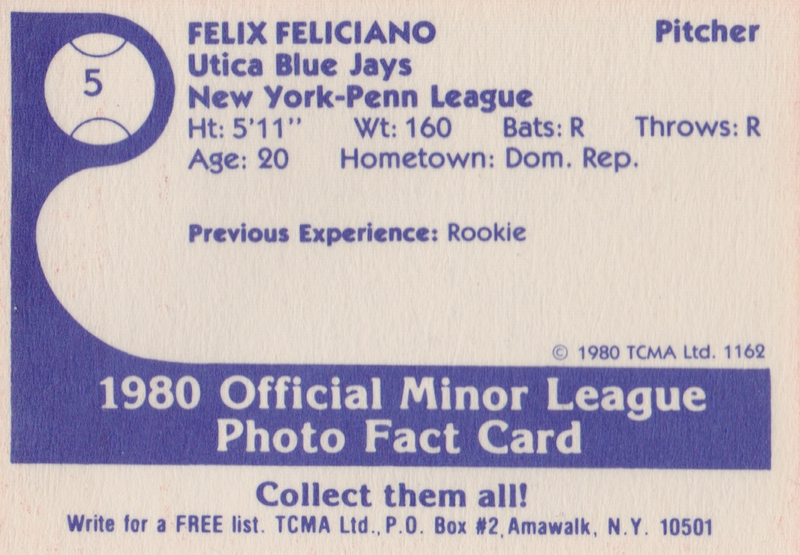 Fakes / reprints: TCMA reprinted several team sets for "collectors kits" in the late 1980s. Those reprints used black ink on the backs and originals have the blue ink shown above.